As I hinted in last week’s style challenge post, I’ve got a really great giveaway to share with you today! I’ve teamed up with the lovely folks at Breil to give one lucky reader this gorgeous watch (pictured above). Pretty awesome, right? As I’ve mentioned before, I am not a fan of complicated giveaways and contests… so I’m keeping this one sweet and simple. Just two easy steps and you’re done! Lets get started, shall we? 1. Follow me on Bloglovin’ or Twitter (your choice). 2. Leave a comment below with your full name and tell me where you decided to follow me. You can enter the giveaway until Sunday, March 4th. You need to have a U.S. or Canadian mailing address to win. I will select a winner at random and announce the lucky person on Tuesday, March 6th. Oh and by the way, my friends Meghan and Krystal are also hosting Breil watch giveaways this week! Each of us are giving away a different style (pictured below) so I recommend tripling your odds and entering their giveaways too. Good luck! Following on both – would love to win! The watches are so pretty. Following you on both! These are gorgeous watches. I’d love to win! Followed on bloglovin- Teresa Dixon. I decided to follow you on Twitter 🙂 my @ is @nuyorkdreaming ! I’m following on bloglovin! Thanks for the chance to win! I love these watches! Thanks for the chance to win. I followed you on twitter (my handle is @lollydaggle). hiI! i am a watch-a-holic and this giveaway is perfect for me!! I am following you on twitter too! I can’t get enough of your blog on Bloglovin’! You’ve got such great style. I follow you on Bloglovin’! Beautiful watch!! I (Nicole Leo) am following you on Blogspot. I’m so happy I found this blog. it’s right up my alley! love love love these watches! i added you to my favorites on bloglovin 🙂 my email is eagan@email.sc.edu! thanks so much for the giveaway! These watches are gorgeous and I’d love to win one! I’m following you on Twitter! I would love the white and rose gold Breil watch, it would be the perfect wrist candy to wear to work. Any Breil watch is amazing! I am following thirty-five inch inseam on bloglovin’. These watches are all just so pretty. I’ve had my eye on a Breil for almost a year. I would looooove this. I am following on twitter. I don’t own a watch so this would be wonderful to add something i wear daily. Started following you on twitter!!! (@sscrowell!) Learned of you from Krystal’s blog but have since put this blog into my google reader to make it a daily read! Fingers crossed! This watch couldn’t be more gorgeous ! Love it ! I’m following you on bloglovin! Love it! I followed you on Twitter. my handle is @WhatAshleyWears. I’m following you on twitter through @lifefoodseattle! I’m following you on bloglovin and I found you through This time Tomorrow. followed you on twitta && bloglovin’ too! i hope i hear from yo soon! Such an awesome giveaway! Their watches are so gorgeous! I followed you on Bloglovin’!! I’m following you on Bloglovin’ Thanks for your generosity! I follow you on both! And love both your blog and tweets! following on twitter @jfong123 ! Gorgeous watches! I love that watch. I’m following you on Twitter! Beautiful watch! I (Mary Burr) follow you on bloglovin. LOVEEEE te watches, and I’m following you! I started following you because I LOVE Krystal’s blog This Time Tomorrow and figured if she says someones blog is awesome it must be! I decided to follow you b/c I like the style of you and the most important thing is that I have a similar body size/type like you. Like this watch for its beautiful details! Lisa Price – following you on both. I love your blog & have been reading for a long time. You inspire my fashion day, love it! Xo. I just recently found your blog, but I love your style! Thanks for hosting this awesome giveaway, Rebecca!! My name is Melanie, and I am now following you on Twitter (And Bloglovin’ too)! You can find me on Twitter @3Pprettyblog. I am now following you on Twitter! Nice to meet you. I love your blog and those watches! I have been dying for a great gold watch and here it is! I started following you on Twitter (don’t know why it took me so long? 🙂 (oh, my twitter handle is cayce_dunn). Thanks for the great giveaway! I, Katie Kondek, love this pretty watch! Looks like it would go great with anything! I am following via bloglovin. These watches are beautiful! I clicked through to your blog from Krystal’s! I just started following your blog via bloglovin! Hello! I followed you on Twitter (I’m @samantharena). 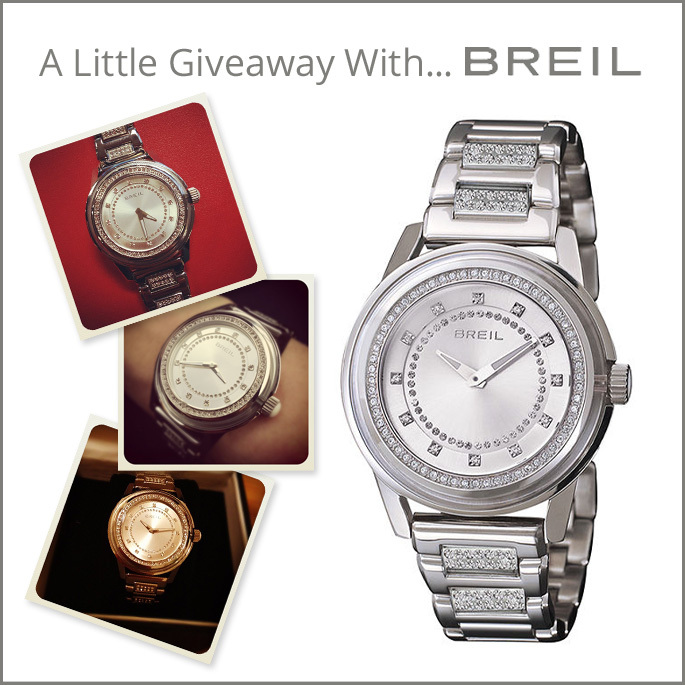 Thanks for hosting a great contest and for introducing me to Breil watches – they’re lovely! I followed you on twitter. CharTar13..thanks for the giveaway! Name’s Joanne E., and following you on twitter! Following you on Twitter (@cherylsoltis)–thanks for the great giveaway! i love these watches! would looove to win one. Following you on blogloving! Thanks for the chance to win a beautiful watch…love the stripes and dots outfit, so cute. I am your 100th follower on bloglovin!! I hope this is a good sign and will bring me luck in the contest. That watch is gorgeous! My name is Rachael Thorleifson. I follow you on twitter @patis2000 Amazing giveaway! FOKXXY i smy twitter name. I am now following you on twitter. I would love to win a gorgeous Breil watch!